Dr. Bahman Zohuri is consulting at Galaxy Advanced Engineering while doing research at Department of Nuclear Engineering, University of New Mexico. Bahman began his career as a Naval Officer as Engineering Duty Officer in the USN, after graduating from University of Illinois with his Bachelor and Master of Science in Physics. After leaving the Navy he worked at Westinghouse in fast reactor safety, integral cross section measurements, as well thermal hydraulic analysis for such reactor. Later on he joined Lockheed Corporation and became chief scientist on star wars program and worked on nuclear weapons vulnerability, space nuclear power, and nuclear propulsion. He also was involved with Laser Radiation hardening and vulnerability different space programs for Strategic Defense Imitative (SDI). He is author of many books and publications. Dr. Zohuri holds a PhD in Nuclear Engineering and his second Master of Science degree in Mechanical Engineering from University of New Mexico. Nima Fathi has for several semesters been teaching heat transfer at the University of New Mexico. 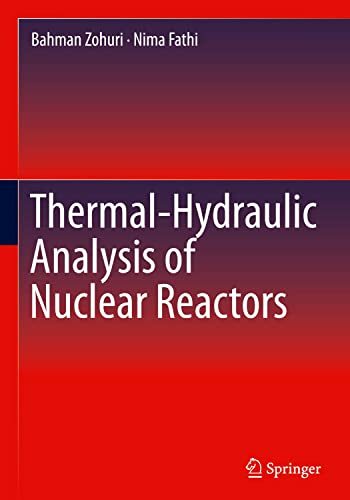 The book is a development of lecture notes used in his classes and incorporation of various industrial and academic research results in thermal hydraulics. He is currently working on his PhD in mechanical engineering and his MSc in Nuclear engineering, after getting his MSc in mechanical engineering focuses on multiphase flow modeling for particle interaction in Stokes flow. Nima Fathi had designed in 2012 a new course, heat exchanger design, for the University of New Mexico. He has several years work experience in the heat exchanger design industry. He has been in involved in the industrial line, from designing, industrial drafting, procurement and fabrication. He has designed more than 86 heat exchanger and pressure vessels. Having a successful collaboration with different large companies, he brings much work experience to his projects. Nima Fathi holds two pending patents on optimization of heat transfer in solar chimney power plants and increasing the thermal hydraulics performance in power plants.